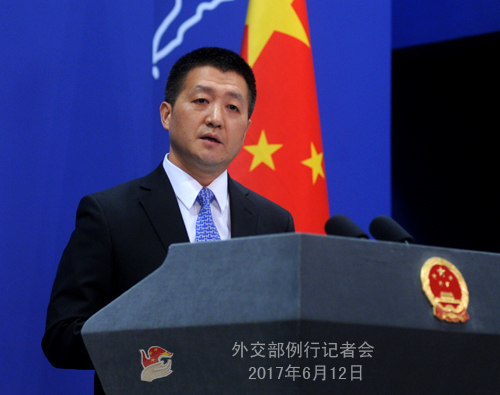 A: On your first question, I believe that you have noticed the statement of the spokesperson of the Foreign Ministry of China made last week. I don't know whether you have also noticed the statement of the Pakistani government. At present, we are coordinating with the Pakistani government to do our best and step up efforts in verifying relevant information. On your second question, I can assure you that at the sidelines of the 17th Meeting of the Council of Heads of State of the SCO Member States, President Xi Jinping held friendly talks with Prime Minister Nawaz Sharif many times. As for those reports you mentioned, I think they are pointless and baseless. China and Pakistan are all-weather strategic partners enjoying relationship that runs long and deep. Q: China has taken over the presidency of the SCO at the conclusion of the 17th meeting of the Council of Heads of States of the SCO. How do you comment on the outcomes of the meeting that just wrapped up? What will China do to further promote the work of the SCO during its presidency? A: President Xi Jinping attended the 17th meeting of the Council of Heads of States of the SCO in Astana, Kazakhstan from June 8 to 9. With concerted efforts, the Astana summit achieved the following outcomes. First, admit new members for the first time. India and Pakistan are now member states of the SCO. Second, uphold the Shanghai Spirit and strengthen close coordination between all members, old and new. Third, jointly make the international order fairer and more reasonable and forge a community of shared future. 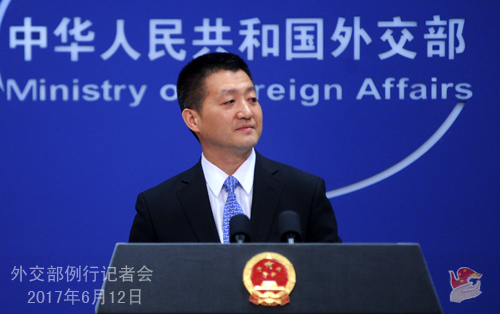 Fourth, speak highly of the Belt and Road Forum for International Cooperation that Beijing hosted in May and support greater synergy and cooperation between the Belt and Road initiative and regional cooperation initiatives and national development strategies. Fifth, deepen cooperation in the fields of security, economics, and people-to-people exchanges, including implementing the SCO Convention on Combating Extremism signed at this summit, promoting regional trade and investment facilitation, and securing more favorable public opinion for cooperation in various fields. Over the past sixteen years since its inception, the SCO has become an important and dependable platform for member states to enhance political mutual trust, expand practical cooperation, deepen good neighborliness and friendship, and jointly safeguard regional security and stability. This summit strengthened the cohesiveness of the SCO member states, charted the course for the future development of the SCO, and put forward new initiatives for the SCO cooperation. At the summit, announcing China's host of the next summit in June, 2018, President Xi Jinping proposed a series of important initiatives and measures in areas of politics, economic, security, people-to-people and cultural exchanges and institutional building in light of China's visions for its presidency, including a 5-year outline for the implementation of the Treaty on Long-term Good Neighborliness, Friendship and Cooperation, a 3-year program of cooperation to fight the three forces, trade facilitation agreement, a mechanism for sub-national cooperation, a mechanism for media cooperation, and forums and activities in multiple fields. These initiatives and measures were well received by all participants expressing their wishes to participate. We will fulfill our duties and work along others to ensure that the SCO will continue to develop in a sound and steady way and play a greater role in the common cause of maintaining regional security and stability and promoting common prosperity, thus delivering more tangible benefits to people in all countries. Q: The SCO Convention on Combating Extremism signed at the 17th Meeting of the Council of Heads of State of the SCO Member States aims to strengthen the security of all SCO Member States, enhance the efficiency of cooperation among competent authorities and improve the legislation in this regard. Can the Chinese side introduce the background of the signing of the Convention and what are China's comments on this? A: Since its inception, the Shanghai Cooperation Organization has taken combating the three forces and upholding regional security and stability as a priority in the cooperation among its member states. A lot of work has been done in strengthening legal basis, improving cooperation mechanism, enhancing capacity building and carrying out joint action and numerous positive outcomes have been reaped in these fields. Formulating the SCO Convention on Combating Extremism is an important proposal put forward by President Xi Jinping in 2014, on which a consensus was built by the heads of states of the SCO member states at the Ufa Summit of the SCO in 2015. Presently, the global security situation is complex, the ideology of extremism is spreading and violent terrorist activities are becoming rampant again, which pose severe challenges to the national security of countries in this region as well as the safety of people's life and property. Against such kind of background, the statement on jointly countering global terrorism issued and the SCO Convention on Combating Extremism signed at the Astana Summit of the SCO further demonstrate the firm resolve of the SCO member states in combating the evil forces and cement the legal basis for the law enforcement and security cooperation of the SCO. I am convinced that these documents will be conducive to deepening cooperation among the parties concerned and make new contribution to the global counter-terrorism efforts. Q: About the situation in the south of the Philippines, it is reported that the US special forces are providing support to the local authorities to fight Islamist militants. What is China's opinion on this US intervention in the Philippines? A: Regarding the measures and policies adopted by the Philippine government in combating terrorism, we have talked about our position many times. Terrorism is the common enemy faced by all mankind. China understands and firmly supports the efforts made by the Philippine government under the leadership of President Duterte in combating terrorism. We support President Duterte's counter-terrorism operations. We believe that under President Duterte's leadership, the Philippine government will stabilize the local situation at an early date and keep the Mindanao region safe and stable. To support this act of justice taken by the Philippine government, we in principle welcome constructive contributions from the international community on the basis of respecting the will of the Philippine government and the sovereignty and territorial integrity of the Philippines. Q: This morning, giant panda at the Ueno Zoo of Tokyo, Japan gave birth to a baby panda. Many Japanese have expressed congratulations on this. I am wondering whether you have anything to share on this. A: I have noted relevant reports as well. This is good news. Giant panda is the ambassador of friendship between China and other countries. We hope that it plays a positive role in strengthening the bonds between the Chinese and Japanese people. Q: The President of the International Football Association (FIFA) will meet with President Xi Jinping in Beijing this week. Will they discuss the possibility of a World Cup in China? Will China officially announce a bid to host the 2030 World Cup? First of all, if we have anything about President Xi Jinping's meetings with foreign guests, we will release them in a timely manner. Back to the topic of football, we certainly want to seek greater cooperation with FIFA and other countries in this field, which will also help improve China's football skills. As for whether one day China will host the World Cup, which has been a dream for many Chinese, we also hope that that day would come sooner. The Foreign Ministry and the People's Government of the Jilin Province will host a promotion event for Chinese provinces themed Open China: Promising Jilin Meeting the World at the Southern Building on 3:30 p.m. 13 June. 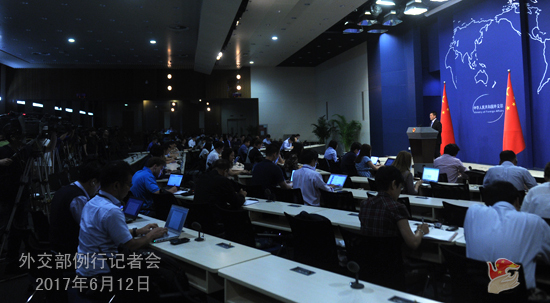 Foreign Minister Wang Yi will address the event. Provincial Party Secretary Bayin Chaolu and Provincial Governor Liu Guozhong will respectively deliver speeches and presentations. Foreign diplomatic envoys and representatives are also invited to make remarks and interact with other guests. As one of the nine provinces sitting at China's border, Jilin is an important window for the northeast China to open up to the world, commanding unique advantages in geographic location, science and education, resources and environment. It is designated as a demonstration province for international productivity cooperation under the Belt and Road Initiative. We hope that this promotion event will bridge the Jilin province and the world for more direct and convenient cooperation. Everyone will surly get a chance to savor the unique beauty of Jilin. We welcome your participation and covering of this event. The regular press conference on that day will be adjourned. The Foreign Ministry Spokesperson's Office will receive your question via phone calls and fax as usual. Due to scheduling reasons, the regular press conference on June 14 will start at 14:30 p.m. at the same venue.